The infrared camera PCE- PI400 / PI450 is a fully radiometric operating device for recording and display of temperature-based images and temperature-based profiles of the object in operates on. 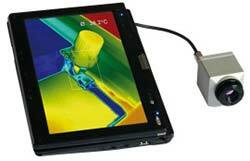 The infrared camera PI400/ PI450 does not only work with the latest technology due to its USB 2.0 interface, which allows a real-time thermographic imaging with 96 images per second and simultaneous image-recording with 32 Hz, but it also efficient due to stationary as well as portable application. Snapshots as well as video sequences can be recorded and archived. The infrared camera PI400 / PI450 is based on a small bolometer (UFPA) with 382 x 288 pixels and a pixel size of 25 x 25 µm. Replaceable objectives allow an adaptation to a variety of measuring distances and object sizes. The high thermal sensitivity allows a display of finest temperature details. 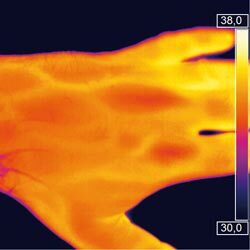 The infrared camera PI400 / PI450 represents therefore an ideal solution for thermographic imaging in areas of research and development, test stations, process automation or for general portable imaging. Via USB cable the infrared camera can be connected to a computer and the data can be transferred without further ado. 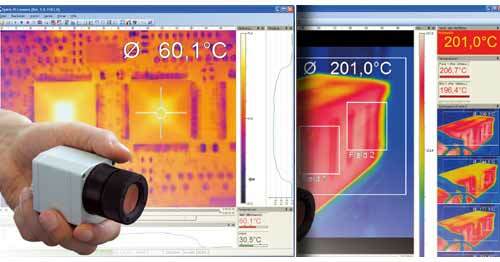 The temperature data of the infrared camera can be transferred as an infrared image to the software PCE-PI Connect, which will be provided. The software features also remote controlling the camera. Furthermore the software features a line scan camera - mode helping to monitor moving objects within a process. 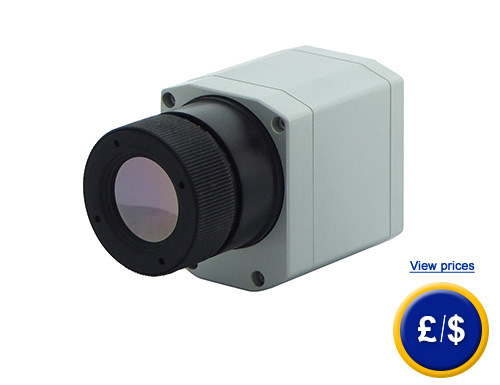 With a weight of only 320 g the infrared camera is a very light equipment with a compact design. In combination with a tablet PC the infrared camera PCE-PI 400 can be also applied for precautionary maintenance or thermal imaging premises. Thus it proves itself as a portable infrared camera for snap-shots as well as a stationary applicable device. Its application range covers e.g. electronic developing, process controlling during development of solar-technologies, or production of LCD flat screens, development of electronic parts, development of mechanical components etc. Depending on purposes of application there are various objectives purchasable, which are listed below with their serial number. In case that you should have more questions regarding the infrared camera PCE-PI 400 / PI 450, please read the following technical data, use our contact form or call us: UK customers +44(0) 23 809 870 30 / US customers +1-410-387-7703. Our technicians and engineers will gladly advise you regarding the infrared camera or all other products in the field of Control Systems, Laboratory Equipment, Measuring Instruments or Scales and Balances of PCE Instruments Ltd.